Football plays are not designed to be easily read -- if you can read them in the stands or in front of the TV, so can the defense. Teams that provide obvious clues to their plays end up struggling for yardage, and the offensive coordinator's job ends up on the line. Shrewd quarterbacks such as Peyton Manning, who can read the defensive alignment well, change the play with an audible before the snap to further disguise their intentions. Still, experienced analysts of the gridiron do share clues to help you read the plays during a game. Watch the five offensive linemen -- the center and the pairs of tackles and guards -- at the moment the center snaps the ball. If they all stand straight up at the snap, the quarterback is going to pass, advises Mark Oristano in "A Sportscaster's Guide to Watching Football." If the offensive linemen shove forward across the line of scrimmage, a run will follow. 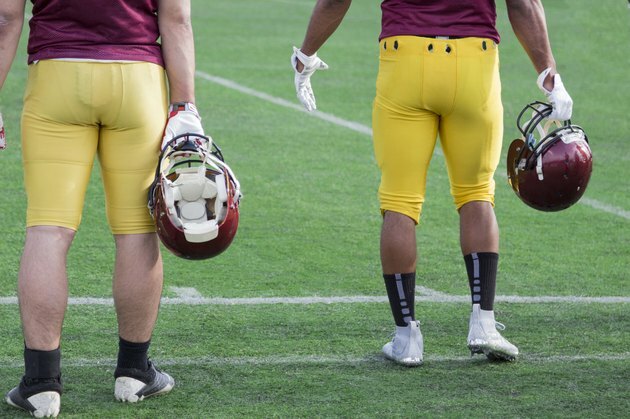 The reason behind the different stances is simple; If an offensive lineman moves across the line of scrimmage during a pass play, a penalty for ineligible man downfield follows. Follow visually the guards who flank the center if the linemen blast forward across the line of scrimmage, signaling a running play. Nine times out of 10 they will lead your eyes to the point of attack, namely where the ball is going, Oristano states. You'll find where the running back is headed before he gets there -- around the same time the defense does. Look for a spread formation, with three or more receivers lined up wide or to one side in what is called the "trips right" or "trips left" formation, as a clue that passing play is imminent. A closely bunched formation, with extra blockers creating a fortress around the ball, indicates a quarterback sneak or attempted run for short yardage, most likely by the fullback. Regard with skepticism movements of linebackers up to line of scrimmage. They are likely faking a blitz and may drop back to their coverage areas. Watch instead the safety who moves up from a deep spot to about 6 yards off the line of scrimmage. Just before the snap, he may start a full-tilt blitz designed to cross the line of scrimmage just after the center delivers the ball to the quarterback. Study the running back's eyes just before the snap if a camera provides this shot. Before the ball arrives, he scans the defense from left to right and back again, looking at its alignment. If he inadvertently stares at the point of attack, the middle linebacker may read this and call out to his teammates the gap the back plans to hit. Watch for the quarterback to react to a blitz by linebackers or safeties by trying to throw a quick pass, designed to avoid the sack, to a receiver who slips into the area vacated by the blitzer. Apply play-reading tips to high school, college or pro levels, being aware that each level ramps up the level of speed considerably. Watch a video recording on your own, so you can focus on the play development, to apply this information to actual game situations. Play the game in slow motion and go back and forth until you see for yourself the patterns that experienced analysts know to look for. Don’t follow the ball, advises Oristano, as well as NFL.com analyst Pat Kirwan in "Take Your Eye Off the Ball: How to Watch Football." It doesn’t tell you what is going on. Nor does all the pre-snap motion by the receivers, running backs and quarterback. All players but one must set for a full second before the snap.